Action! Fun! Dance! : Music Your Kids Will Love!! My daughter loves to sing and dance. She will make up her own song if she has to. The other day I heard her singing in her room. I couldn’t make out the words, but I could most defiantly tell she was singing. I want to encourage her to keep doing that for as long as she will enjoy it. That’s when I discovered The Learning Station. It’s the go to place for kids music. I received a copy of their Action! Fun! Dance! For Kids CD. 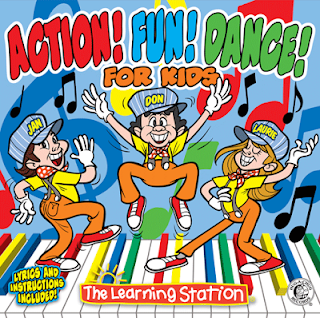 Kids of all ages will laugh, dance and sing-along with this engaging fun collection of songs that inspire laughter, fitness and learning. This interactive CD features modern versions of popular classics and original movement songs galore. There are super silly grooves to tickle your funny bone, lively dances and interactive activity tunes to encourage youngsters to stay active, heart-smart and healthy! My daughters top two favorite songs are Icky Sticky Bubble Gum and Funky Nursery Rhymes. She loves dancing along to both of these songs. She will pretend to stick the gum all over herself (and sometimes her sister). I have to agree with her that the Funky Nursery Rhyme is a pretty cool song. We were in town running errands one day while the CD was playing. I was dancing a long with her at a stop light. I swear when the vehicle pulled up besides that they were looking at us funny. They probably were wondering what in the world we were doing. Oh well…we were having fun!! The one thing that’s great about this CD is it’s not just plan old music. It’s music that makes you want to get up and move!! It’s contagious. I can’t listen to it and not move! So get up and move!! They are currently giving away “Action! Fun! Dance!”. You can participate by visiting our blog or joining them on Facebook.